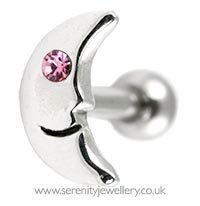 Sterling silver or hypoallergenic surgical steel smiling moon design with rose crystal eye on a 316L surgical steel 6mm or 8mm bar with 3mm screw-on ball closure secured at the back of the ear. 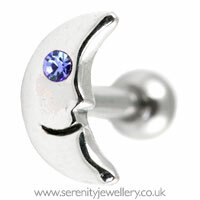 The moon is 7mm long. 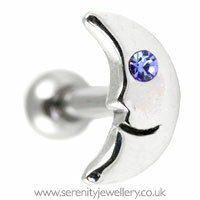 The moon stud is designed to follow the curve of the ear so it comes in a left and right ear version. Please select the ear that the earring is for. So if you have your left ear pierced you'd need the left ear stud. 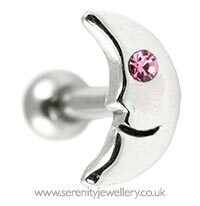 The one exception to this is front/forward helix piercings where you will need to select the opposite ear for the earring to follow the curve correctly. 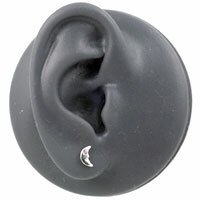 I absolutely love this earring. Looks so cute in my helix, easy to put in and very comfortable. Perfect! 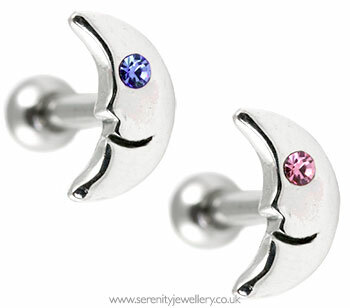 Happy shiny moon, my upper ear loves it.